So, your binaries are hosted on Bintray and you are watching your package download stats grow. It’s time for a boost! Two great new features online today; they might be small but they are powerful in spreading the word about your packages, or packages you like. 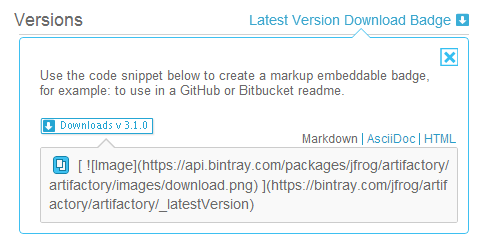 Add a Download Link badge to your GitHub or Bitbucket ReadMe’s using our new Latest Download Image generator. This will create a badge showing a download button, linking to the latest version of your package. Currently we support: Markdown and Asciidoc, or plain old HTML. 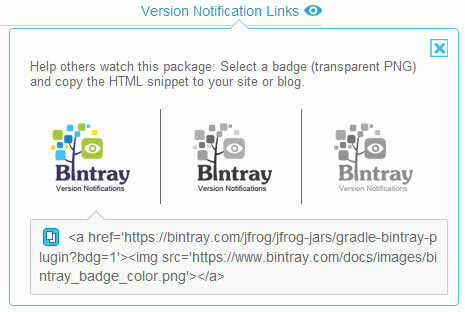 Visit any package hosted on Bintray and you will now find a “version notification link” badge that you can copy-paste to your website / blog / email. When your visitors click the badge, Bintray will encourage them to Watch the package, in Bintray’s usual friendly, non-obtrusive kind of way.